A member of the water frog group with green to brown backs, this taxon is very similar to Rana ridibunda. They are distinct mostly in frequency differences of electrophoretic alleles (e.g a-GDH:b (a slow allele) is predominant compared to the a (a fast allele) Rana ridibunda) and voice parameters. The distribution of this species is not well known, in the west it occupies whole Anatolia, probably parts of Thracia (Greece), the frogs from El-Fayum (near Cairo) belongs to this taxon, but their extension to the South and East are unknown. The following recordings a short sequences of longer recordings. These files are size reduced (MULAW 8-bit encoded) from 16-bit encoded sound files. Synonyms: Rana esculenta var. bedriagae Camerano 1882, Rana ridibunda caralitana Arikan 1988, Rana levantina Schneider, Sinsch, and Nevo 1993. Camerano, L. 1882. Recherches sur les variations de la Rana esculenta et du Bufo viridis dans le bassin del la Méditerranée. C. r. Soc. fr. Av. Sci. 10: 680-692. Dubois, A. 1992. Note sur la classification des Ranidae (Amphibiens Anoures). Bulletin mensuel de la société linnéenne de Lyon 61(10): 305-352. Schneider, H. and T.S. Sofianidou. 1985. The mating call of Rana ridibunda (Amphibia, Anura) in northern Greece as compared with those of Yugoslavian and Israeli populations: proposal of a new subspecies. Zoologischer Anzeiger 214(5/6): 309-319. Schneider, H., U. Sinsch, and E. Nevo. 1993. 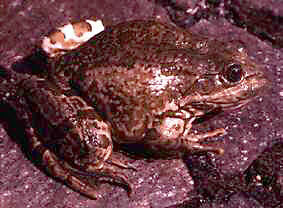 The lake frog in Israel represent a new species. Zoologischer Anzeiger 1/2: 97 -- 106.